8.5x11, ix + 38 pp. The years between 1719 and 1733 might be called the "golden years" of Dresden—a time when Friedrich August I was firmly established as the Polish king (named August II), the elector-prince's extremely fertile marriage secured the survival of the house of Wettin, and Saxony also enjoyed increasing prosperity. Music at the Dresden court was led by Johann David Heinichen, appointed to the post of kapellmeister in 1717 by the elector-prince, and he and the many other young and talented artists from the court transformed the new musical developments of Vienna, Venice, Rome, and Paris into something that could be called the characteristic "Dresden style." 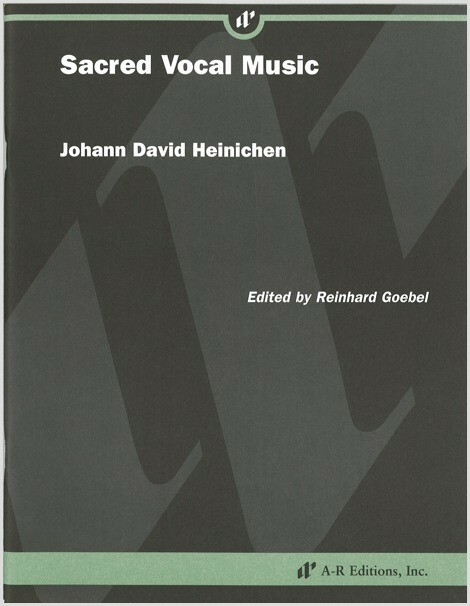 A selection of Heinichen's rich body of church music demonstrates the depth of his ingenuity of expression and instrumentation that among later generations earned him the title of the "German Rameau." His settings of "De profundis" and "Warum toben die Heiden" for bass, strings, and continuo contrast his Dresden style with that of his very early (pre-Venetian) career. Heinichen's setting of "Nisi Dominus" for tenor with obbligato oboe was probably an inspiration for Bach's similarly scored cantata arias. His "Alma Redemptoris Mater" for alto, flutes, oboes, strings, and continuo is composed in concerto form and has a remarkably French elegance.